Dostoyevsky’s autobiographical novella, The Gambler, has inspired at least ten international movies and an opera by Prokofiev. In 2009, Welsh-born poet Glyn Maxwell adapted the book for BBC Radio. 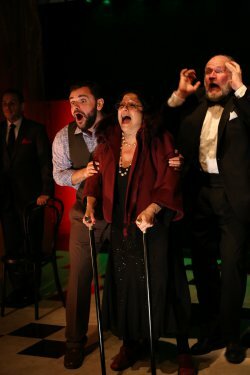 Now Phoenix Theater Ensemble is staging his script as part of its winter season, performed in repertory with Strindberg’s Creditors. Director Lordi-Kirkham has unaccountably staged the play as though it were a radio play or a reading, making it more talky and static than it needs to be. While the text is faithful to the Russian novella with some trimming to reduce the number of characters, the use of both a narrator and much of the narration from the novel makes this seem like an interior monologue rather than a play. 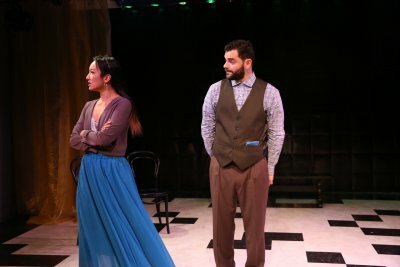 Unfortunately, the actors playing the twenty- somethings who are given the most stage time do not have the technique necessary to bring off this psychological drama. At two hours and 10 minutes with no intermission, this is a long evening in the theater. The story follows the young adulthood of Alexei Ivanovich who falls in love twice: once with beautiful heiress Paulina Alexandrovna and then with the roulette wheel, both of which ultimately destroy him. Told as a flashback by Alexei, the events take place in the late 1850’s. Arriving at the German spa of Roulettenberg, tutor Alexei has brought the General’s three nieces, the grown-up Paulina (with whom he is in love) and her two younger sisters to join the General who had gone on ahead from Paris. Instigated by Paulina for her amusement and to test how much Alexei loves her, Alexei insults Astley at dinner and is fired by the General. Just as the family thinks that Granny’s death is imminent, the old lady shows up and takes up roulette to the horror of the family who are afraid that she will fritter away their inheritance. Eventually, Alexei tries the roulette table himself in order to win Paulina with disastrous consequences for all. Lordi-Kirkham has chosen to use a unit set designed by Tsubasa Kamei, with an assist by Jennifer Stimple Kamei, with only a few chairsand a bench as decoration that is devoid of atmosphere, as well as no props. Although we are told by Alexei that the story takes place in the late 1850’s, Jennifer Stimple Kamei’s stylized costumes (which remain basically the same all evening) suggest the 20th century rather than the right period. Tsubasa Kamei’s lighting which includes turning the doorway exits of the set red or blue at moments of dramatic intensity is rather trite. Considering the audience is basically looking at the same design for 130 minutes, the set and costume choices seem to be a disservice to the production for a story which takes place in a lavish milieu. Ellen Mandel, on the other hand, creates an entire casino with her memorable sound design though we actually see nothing of the palatial rooms. The huge role of Alexei Ivanovich requires the actor to be on stage at all times. As this narrator/main character, John Cosentino lacks nuance and technique and his Alexei is not only callow but rather flat and one-dimensional. So too, Poppy Liu’s Paulina Alexandrovna is petulant when she should be mysterious and enigmatic. Which of the men does she love and with whom is she playing a game by her sarcasm and seeming contempt? Only veteran actress Elise Stone as Granny gets it right. As the vulgar, animated and ebullient old lady, she gives a nuanced performance that always keeps us guessing as to her real motives and she takes command of the stage whenever she appears. The other members of the cast are either mildly comic or bland in roles that should be played to the hilt. John Lenartz’s General is merely besotted while Morgan Rosse’s Mlle. Blanche makes her greedy intentions too obvious. Joseph L. Menino is a stereotyped Frenchman with his De Grieux, while Matt Stapleton is done in by the inane British idioms and expressions with which his Astley is saddled. Unseen but very much a part of the soundtrack, Nick Boyan has a fine French accent and demeanor as the voice of the Croupier. Dostoyevsky’s The Gambler is a difficult book to adapt as it is basically an interior monologue as are several famous 19th century Russian novellas. 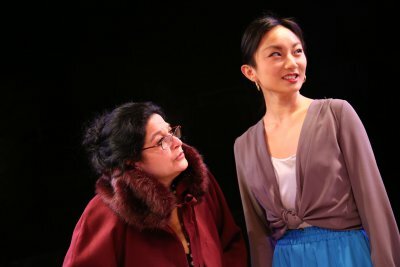 In trying to keep that framework, director Karen Lordi-Kirkham in her production for Phoenix Theatre Ensemble has emphasized the wrong elements. The result is that the stage version of Glyn Maxwell’s radio play is stillborn on the stage of The Wild Project. One unrequited relationship, one very happy marriage, and one that takes time to find its way in Patrick Thomas McCarthy’s new fromance. Simon Godwin, Britain’s go-to director for reimagined classics, stages an updated revival of the problem comedy which offers its contemporary relevance. The eventful life and career of the long-time Harlem congressman is chronicled in this interesting solo play that showcases the talents of Timothy Simonson.